Ava, aka U Too Ava, is a beautiful 4-year-old red fawn female born June 15, 2007. Her sire is Lonesome Cry, making her grand sire the late famous Gable Dodge, and her dam is U To Austina. 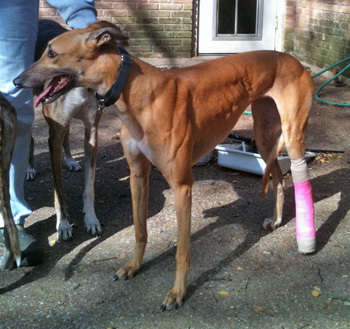 Ava's 22 race career came to an end on December 16, 2010, when she broke her left hock during the third race of the day at Gulf Greyhound Park in La Marque, Texas. Ava was transported to Austin on Sunday, December 19, and surgery was performed on Wednesday, December 22, with Dr. Stephen Kerpsack of the Central Texas Veterinary Specialty Hospital. Dr. Kerpsack implanted a 5 hold plate with screws into Ava's fractured hock using some of her bone for a graft. Ava is now fully recovered and ready to start looking for a family to call her own. Ava has not yet been tested with cats or small animals.